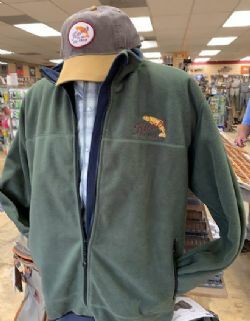 Mountaineer quality fleece jacket has 2 layers of fleece with a waterproof-windproof membrane sandwiched in-between. This is not a lightweight fleece. The jacket is meant for colder, windy conditions. It is a mountain jacket that is designed to keep you warm. The jacket can serve as an under-layer for extreme fishing conditions, then worn to dinner the same evening. Zippered pockets and draw tight waist cord to adjust to proper fit. This is nicely made and will give many years of warmth to the outdoorsman. Hey, we wear it skiing and took it to Ireland for sight seeing. It gets very windy in Ireland.